Diane got release 2.0 of her kayak trailer off the ground. This one works much better than Release 1.0. It's a basic off the shelf bike trailer with minimal mods, the main one being an extended tube connecting the trailer to the hitch. 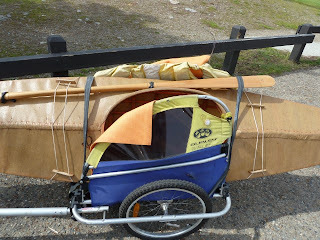 The kayak is held in place by two bicycle inner tubes. Next project, how to get this rig on the trans-bay ferry. I like it. Simple and effective. What are you using to keep the extended bar in place?